The video to the left does not contain any imagery, but can be used to help students who need to listen to the story as they follow along in the text. Julia Alvarez and other immigrants share their experiences of being new to America with Cambridge READS, a program of the Cambridge Public Library. This video is a discussion of “How the Garcia Girls Lost Their Accents” by Julia Alvarez. The video is long, but the video host, Roxanne, shares her personal insights into the immigrant experience and how she related to the book. Note: There may be some language in this video. I noticed some usage of profanity in another of her videos, but did not hear any in this one. Help students internalize the meaning of new words through reading and their own writing. 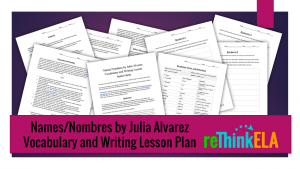 Download this lesson plan now!